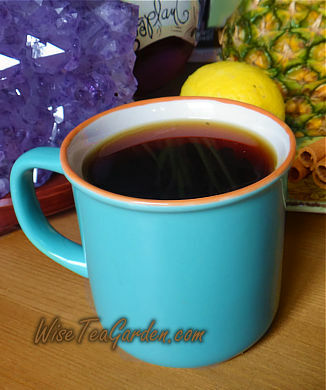 CUP of ORGANIC SCOTTISH CARAMEL PU-ERH © WISE TEA GARDEN® Pu-erh is also called a 'Living Tea'. There are two types of tea we in the West commonly refer to as Pu-erh: Raw Pu-erh (Sheng tea) and Ripe Pu-erh (Shou tea). The difference is in the aging process. Raw Pu-erhs are typically fermented very slowly by being stored in cellars and aged for up to 25 years. Raw Pu-erh vintages are characterized by warm tones of earth, damp moss and oak that shift and shape during the aging process. Ripe Pu-erh is processed according to a method developed at the Kunming tea factory in 1973. The Kunming factory invented a new processing method in an effort to make Puerh teas available to ordinary tea drinkers in China. When making Ripe Pu-erh, the tea is fermented over a matter of weeks under heavy wet blankets. During fermentation, the tea develops characteristics very similar to that of aged Pu-erh. The leaf is then pressed into a cake-like form, wrapped, dated and shipped to market. In China, some of the exceptionally rare and aged Pu-erhs can be sold at auction at 10-15 thousands dollars per Pu-erh cake (pie). 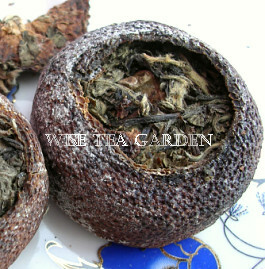 Note that White Pu-erh is one the rare teas, and is generally produced for the internal market in China. Pu-erh Mandarins are one of the China's most interesting and uniquely rare teas. Besides the obvious fact that the tea is packed in an mandarin (tangerine), the care of craftsmanship used to get it in there cannot be underestimated. From the careful plucking of centuries old tea bushes, to the rolling on wide wicker baskets to the natural wood fires used to flash heat the mandarin orange peel, everything is done entirely by hand! Steeping Time: Pu-erh is the most fermented tea, with a very low content of tannin. Brew for 5 minutes.  Postage is adjusted within 2-3 business days if an overcharge for shipping exceeds $1.50. Cup Characteristics: Full flavored cup with excellent caramel and toffee notes, smooth and sweet finish. Earthy and musty character of traditional Pu-erh is blended with the sweet, burnt sugary profiles of Caramel and Toffee. This tea is the favorite beverage of the Scotland-China Association. 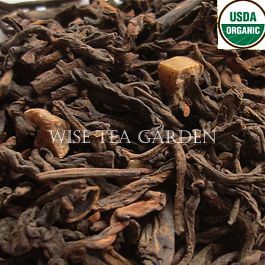 Ingredients: Organic Black Tea Pu-erh style, Organic Almond Pieces, Natural flavors (Organic compliant). Infusion: Dark and stormy night. Cup Characteristics: White Pu-erh produces the outstanding cup with warm notes of vanilla, early spring grass and the subtle character of a lightly roasted mountain oolong. Besides the obvious fact that the tea is packed in an orange, the care of craftsmanship used to get it in there cannot be underestimated. From the careful plucking of centuries old tea bushes, to the rolling on wide wicker baskets to the natural wood fires used to flash heat the mandarin orange peel, everything is done entirely by hand. Rare tea. Ingredients: White Pu-erh tea Mandarin. Infusion: A light yellow liquor resembling camomile tea with gentle astringent assertiveness, sweet notes of citrus, honey and vanilla, and a clean finish. There is a believe that it this tea lowers the blood pressure.